Valentine’s Day is approaching, and Down Under Endeavours is in the know when it comes to the most romantic spots in the world to take your significant other. From overwater bungalows in Bora Bora to grand country estates in New Zealand, we’ll help you plan the perfect romantic getaway! 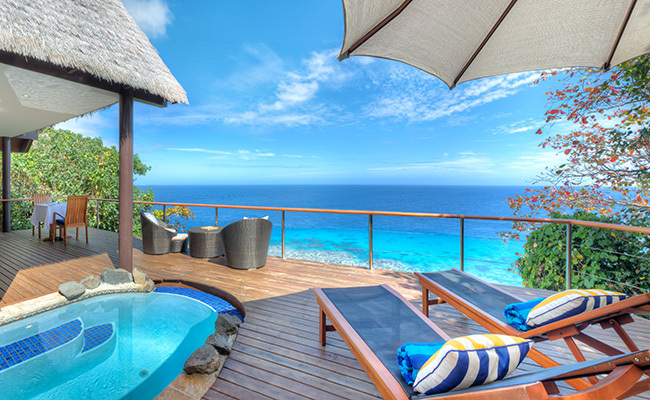 Below are some of our top choices in the South Pacific. 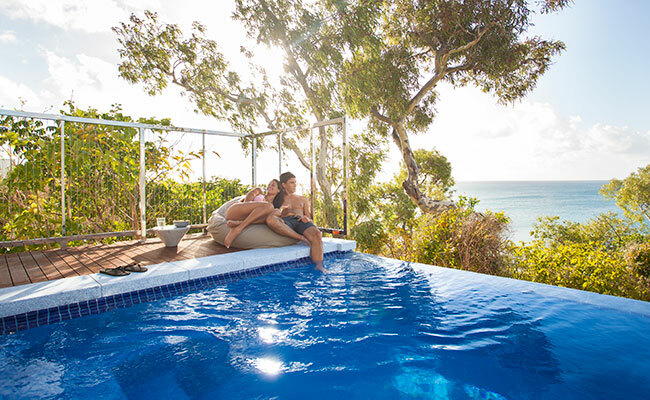 Secluded sandy white beaches, gorgeous blue lagoon waters, beautiful scenery, and an amazing spa—Lizard Island will whisk you away on a romantic holiday! Enjoy a private picnic lunch on a secluded beach or a romantic dinner at the 5-star Ospreys Restaurant. The Essentia Day Spa offers a plethora of indulgences, including a 50-minute couple’s massage. Not feeling like leaving your fabulous suite overlooking the Great Barrier Reef? No worries! All you need to do is call room service and enjoy a romantic dinner on your private verandah. 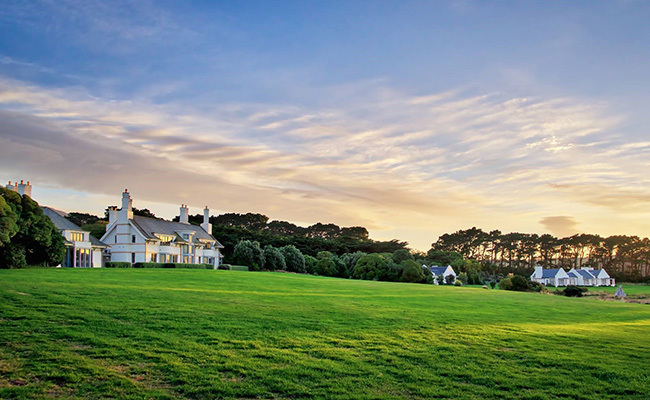 Leave your stress behind and step back in time to an era of grandeur and gracious lifestyle as you immerse yourself in the gorgeous Wharekauhau Lodge. Wharekauhau is the ultimate in New Zealand romantic getaways and offers lodge accommodation or Cottage Suites, each offering unique touches of times gone by. The Cottage Suites offer you luxury and comfort while resting above the thunderous surf of Palliser Bay. Here, you can relax and soak up the dramatic views. If you’re looking for more than just relaxation and romance, spice up your vacation with some adventure. The lodge offers horseback riding, archery, mountain biking, surfcasting, quad biking, clay target shooting, and wine tasting. Rumours Luxury Villas & Spa is the perfect exotic destination for a romantic getaway. 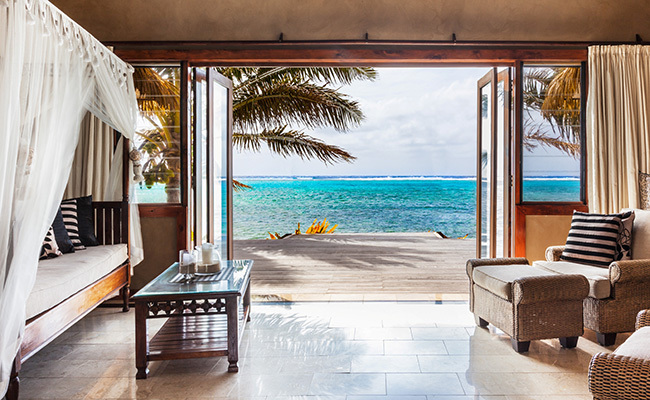 Every villa boasts gorgeous views right out to the beach overlooking Muri Lagoon. Or, you can sit on your terrace overlooking your private pool and tropical garden area, complete with your own waterfall! If you’re celebrating a special occasion or honeymoon, Rumours will put the perfect special touches in place to make your stay even more romantic. As an exclusive adults-only sanctuary, Royal Davui Island Resort is one of the most romantic and private resorts in Fiji. Boasting luxury, elegance, and privacy like no other, you’re in the perfect place to rekindle the flames with your significant other. Only a few guests can be accommodated at the Royal Davui, creating an exclusive and magical experience throughout your stay. Let the white sandy beaches, turquoise waters, and gorgeous sunsets sweep you away to a romantic paradise, filled with champagne breakfasts on a sandbar, relaxing spa treatments, and pristine private beaches. What are you waiting for? 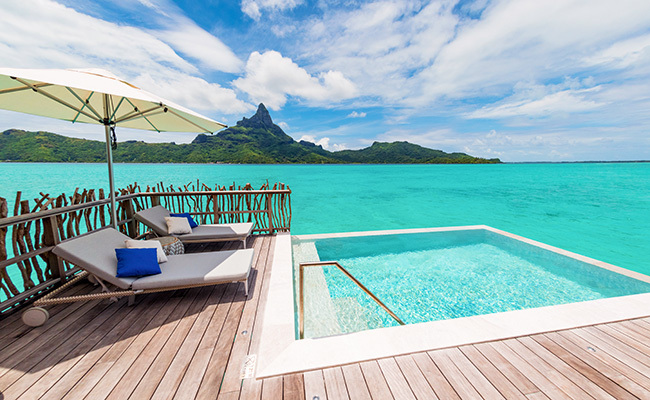 The Intercontinental Bora Bora Resort & Thalasso Spa is one of the hottest spots to go for a romantic vacation. Begin your day with breakfast delivered to your overwater bungalow via canoe. Enjoy lunch on a private beach and spend an afternoon at the Deep Ocean Spa indulging in a heavenly massage. End your day with a sunset cruise on an outrigger canoe followed by a delicious dinner on the beach. Your romantic getaway will be full of little touches that make your stay extra special. Start dreaming up your romantic getaway today! Browse our handcrafted romantic travel packages, or contact us to match with your personal luxury travel designer.